Residents of a Port Richey neighborhood are frustrated with speeders using their street named after a famous author as a cut through between neighborhoods and blowing past the 30 mile an hour speed limit. Residents that live near Mark Twain Lane claim driver’s whiz up and down the street cutting through neighborhoods travelling at speeds well above the 30 mile an hour speed limit. Many of the parents in the Port Richey area are worried about the safety of their children, which is why the county is looking into installing speed tables. However, at this time, federal dollars will not cover the entire cost of the three speed tables that residents feel are needed on this street. Instead, each homeowner would have to fork over $400 to get the speed bumps installed. According to a county study, about 700 cars a day use Mark Twain Lane and a majority of the drivers are speeding. The county commissioner is currently exploring other options for getting the speed bumps put in so that homeowners would not be liable for any of the costs. Until then, residents strongly urge motorists to slow down and follow the speed limit. 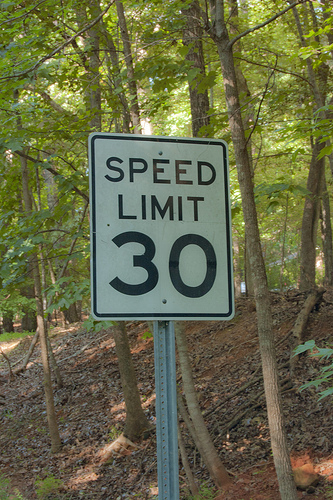 Every month in the United States, around 1,000 people are killed in motor vehicle collisions involving speeding. Speeding accidents often result in severe injuries as this is considered one of the most dangerous activities a driver can partake in when travelling on roads and highways across the nation. A variety of different issues arise as a driver’s speed increases on the roadway. The main problem is that speeding motorists have reduced reaction times making it difficult to react quickly to changes in road signs or with the flow of traffic. Additionally, speeding can make it impossible to stop in time for pedestrians and even respond to other sudden or unpredictable driving factors. As a result, injuries suffered due to speeding drivers are often severe, not to mention these types of collisions usually cause an extensive amount of property damage. An estimated 13,000 people are killed every year in the U.S. where speeding was a factor in a motor vehicle accident. According to The National Highway Traffic Safety Administration, nearly 34 million speeding tickets are issued annually in the U.S. Shockingly, these statistics break down to 65 speeding tickets issued every minute. Speeding is clearly an issue throughout the country, including the communities of Port Richey, Dade City, New Port Richey, Zephyrhills, Land O’Lakes, Hudson, Holiday, Lutz, Trinity and Wesley Chapel. If you or a loved one has been injured in a motor vehicle collision caused by speeding, a Pasco County Auto Accident Attorney at Whittel & Melton can help. Whether you were another driver, passenger or pedestrian injured by a speeding vehicle, you may be able to recover compensation for your injuries. Please contact us today at 727-847-2299 or fill out a free online case evaluation form. Your initial consultation is always free.